Staying close to the source! 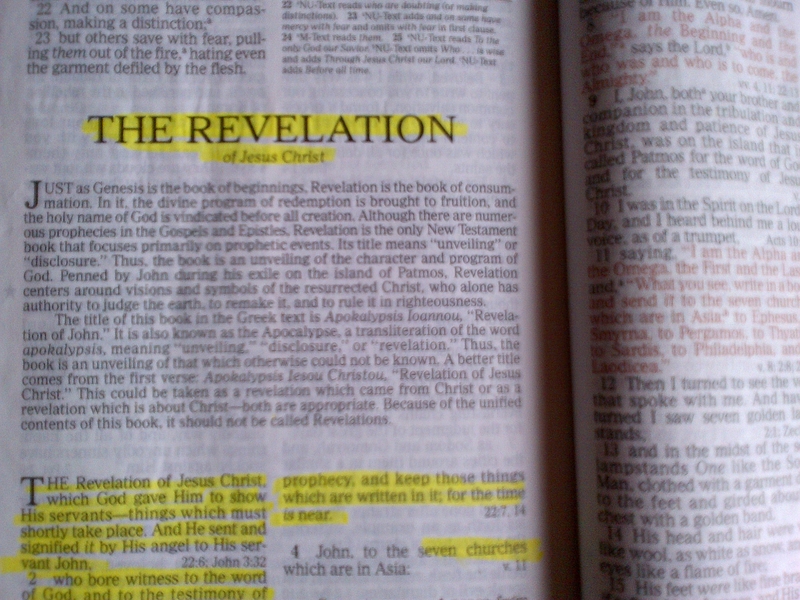 I enjoy learning as much as I can about Biblical prophecy. So much of what the media has portrayed over the last several decades is just bunk. Before I came to Christ I remember watching movies that would touch on the subject, demonstrating God pouring out his wrath in various ways but never told anything even close to the real story. It is a subject that brings fear to a lot of people. Fear that motivates them for a while to seek God, but over time they lose interest and move away from anything resembling intimacy with Him. Anyone that is seeking God just to avoid His wrath in days to come, is missing the most wonderful thing about Him. They are missing a relationship of love and intimacy that only He can offer. When we come to know who God is, through Christ, we begin to see Him as the loving Father He is and understand that He always desires our fellowship. Fear can draw us to Him but only LOVE will keep us walking with Him. As we learn of who He is through reading the Word of God, spending time in prayer and spending time in His presence, it slowly begins to sink in how NOTHING can separate us from the LOVE of God. NOTHING! Paul said it beautifully in the book of Romans…. Romans 8:38,39 NIV 38 For I am convinced that neither death nor life, neither angels nor demons, neither the present nor the future, nor any powers, 39 neither height nor depth, nor anything else in all creation, will be able to separate us from the love of God that is in Christ Jesus our Lord. If you are finding yourself fearful of the things you see on the news and it is causing you anxiety or stress, realizing many of the things coming to pass have been prophesied, take yourself back to the Word of God. Rediscover through Christ, how very much He loves you and what He did for you! When we know how much He loves us, we can than trust that He will never give us anymore than we can handle. 1 Corinthians 10:13 NIV 13 No temptation has overtaken you except what is common to mankind. And God is faithful; he will not let you be tempted beyond what you can bear. But when you are tempted, he will also provide a way out so that you can endure it. As a young believer, I remember feeling incredible fear at times when I would read or see something on the news that had been predicted to happen in the latter days. It used to cause me a lot of anxiety and I would lose sleep over it. I would dwell on all the possibilities of what could result and how it could affect me, my loved ones and friends. Today, though it upsets me to see things that are going on; mans inhumanity to man, abuse, mistreatment, hatred, wars etc., I no longer fear the future. I am sure of one thing, Christ will never leave me or forsake me. He has seen me through many trials and will continue to be with me as I complete my journey here. He is faithful and true. His love for me is available every morning! He hears me when I cry out to Him. He walks with me through every minute of every day! What He does for me, He does for all His followers. He is no respecter of persons but loves us all equally. When we take our eyes off of Him and focus on the outward things around us only, we become a slave to our fears and emotions. So while we wait for His return, let’s spend more time with the lover of our soul. As we remain in close intimacy with Christ, fear departs! 1 John 4:18 NIV For there is no fear in love, But perfect love drives out fear, because fear has to do with punishment. The one who fears is not made perfect in love. Good thoughts. Eschatology is not suppose to create fear or anxiety, but HOPE! Thank you! So true, when we are abiding in Him it does!